Sue recently retired from Parkview Health after more than 25 years. She served as Chief Experience Officer since 2014 and previously served as President of Parkview Hospital and Affiliates as well as the Executive Vice President and COO of Parkview Hospital. In addition, Sue served as Chief Quality Officer and CIO for the health system. 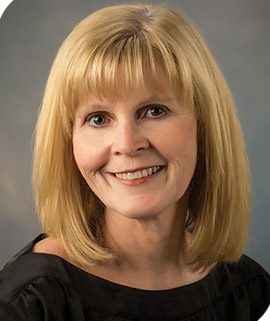 Sue began her career in healthcare as a nuclear medicine technologist and then became program director for the Fort Wayne School of Radiography, a joint venture of St. Joseph Hospital and Parkview Hospital Radiography Programs. She joined Parkview in 1993, responsible for quality improvement and customer service. The experience of Sue includes executive leadership, direction and administration of hospital operations and planning in the areas of human resources, diversity and inclusion, community health improvement, innovation and education. Sue’s passion has been and continues to be directed in humanistic interactions and the health of the community. Sue serves on the Boards of The Rescue Mission, United Way of Allen County, Brightpoint and the Schwab Foundation.